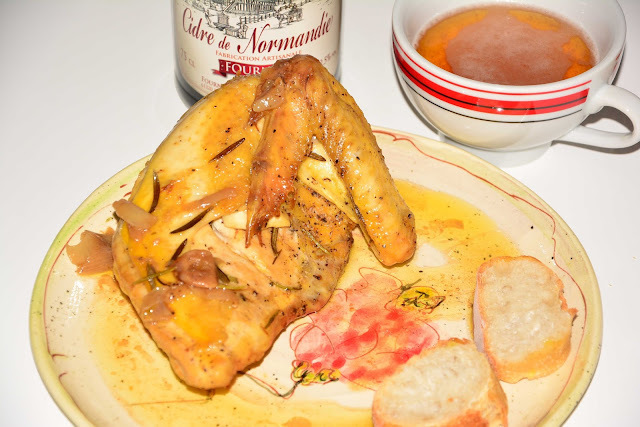 The Paris Feast: Roasted chicken with a cider twist. Roasted chicken with a cider twist. 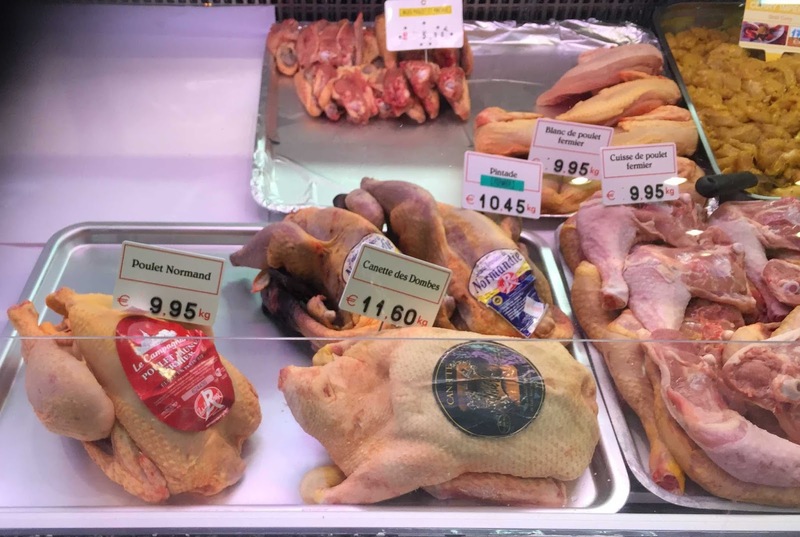 Festive season is in the air and it is that time of the year when we marinate and throw every type of bird meat in the oven, wishing for the perfect roasted bird. 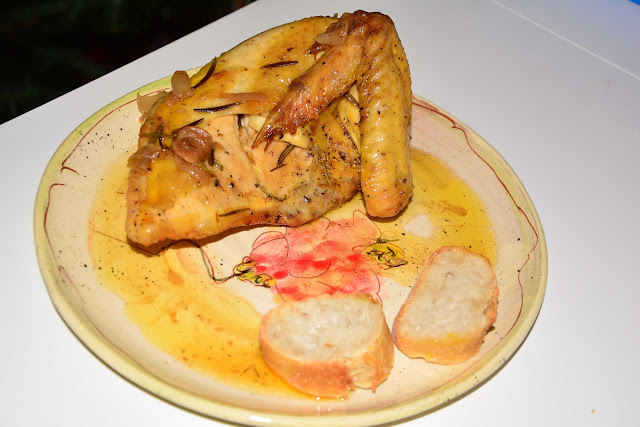 Of course of all the birds, the chicken is the most popular, so I thought of starting off the season with roasted chicken. 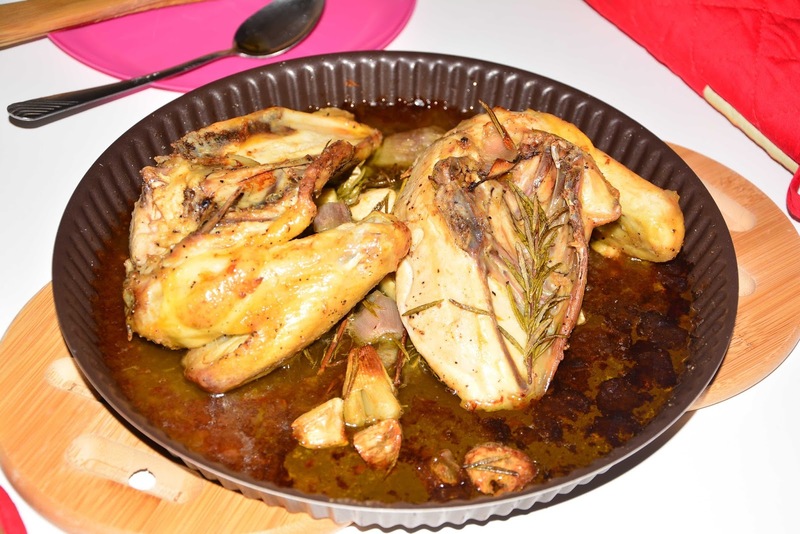 Well, I did not roast a full chicken, as you can understand, we are just two people to devour the things I cook. However I got myself two breast pieces of free range chicken from our local farmers’ market, and I must say that even 800gm was a lot for the two of us over dinner. But we managed, rather we loved to finish it off completely the same day, may be because it was that perfect and that delicious. 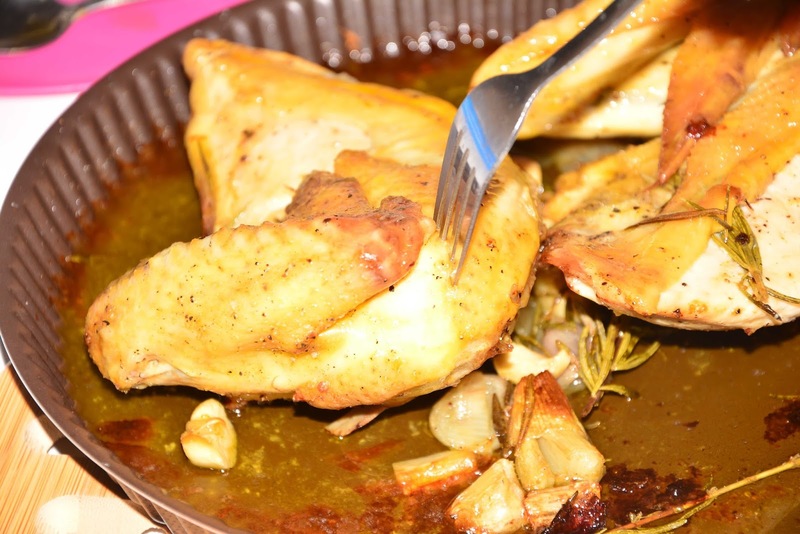 So here is the recipe for roasted chicken breasts and wishing you all a great festive season. Place the breast pieces of chicken in a roasting pan preferably a non-stick one. Season it nicely with adequate amount of salt. Next season it with freshly ground black pepper. 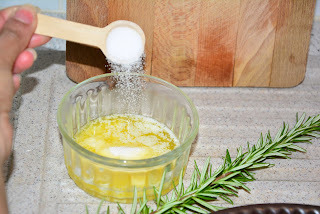 Mix two teaspoons of salt with 30g of melted unsalted butter. Add freshly ground black pepper to the melted butter mixture. Mix it well. The homogeneous mixture will look like this. Massage this melted butter mixture nicely to the chicken on all the sides. Make sure to massage the flesh underneath the skin without tearing it apart. This step is very crucial. Poke the skin of the wings with a sharp knife. Make two slits on the breast pieces and one small slit on the thick head of the breast piece. Place some roughly chopped garlic on the chicken and also underneath the chicken. 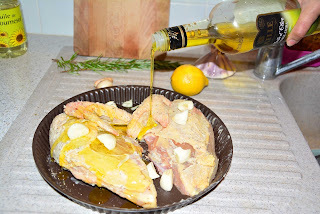 Pour the extra virgin cold pressed olive oil on the chicken. Place the fresh rosemary on the chicken. 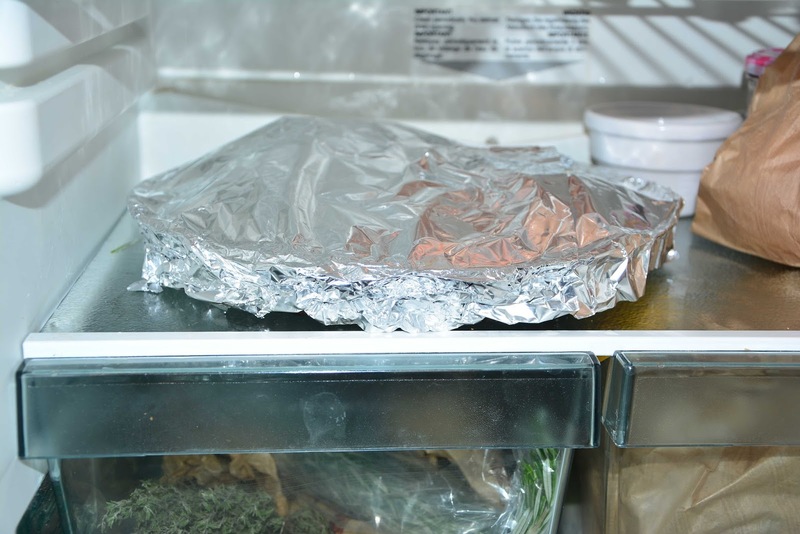 Wrap it with aluminum foil and place it in the lower rack of the refrigerator for an hour. 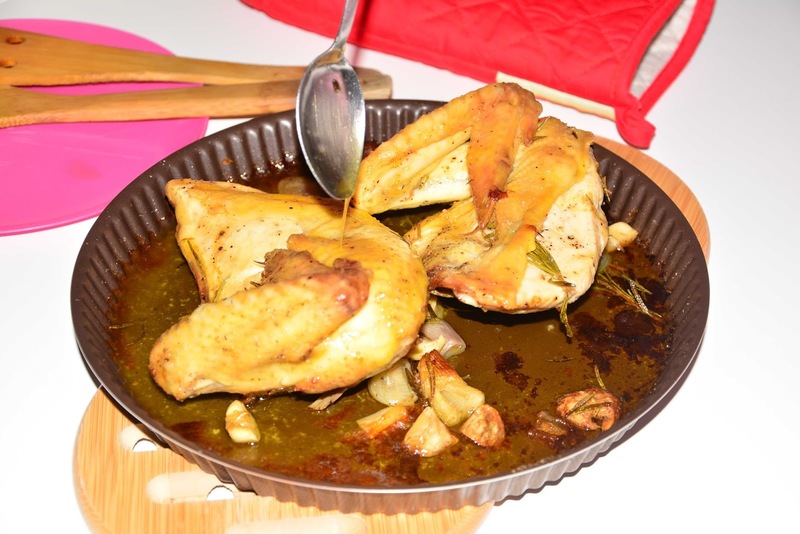 The seasonings work wonder and the resultant chicken is juicy and succulent. After an hour take out the chicken from the refrigerator and let it come to room temperature. 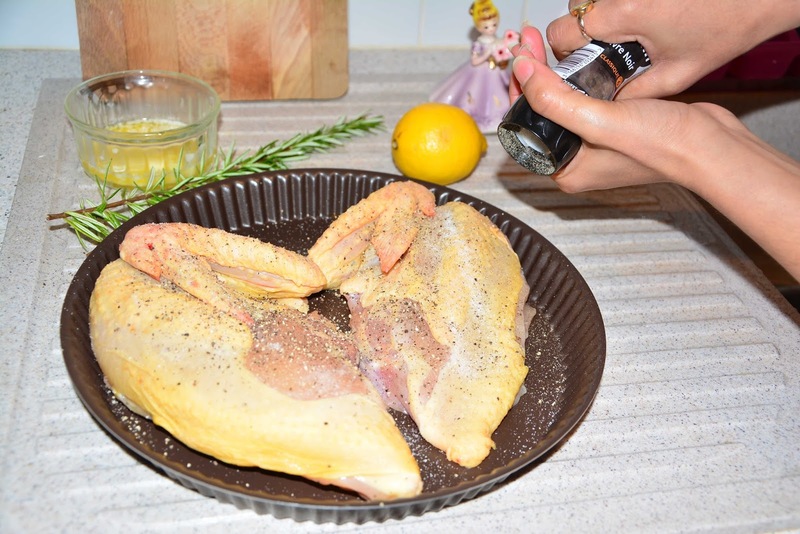 Remove the aluminum foil and add freshly scraped lemon zest to the chicken. Add roughly chopped shallots to the chicken. 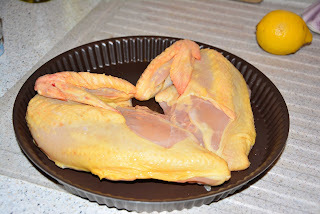 Place some on top of the chicken, some underneath the skin of the chicken and some below the chicken. 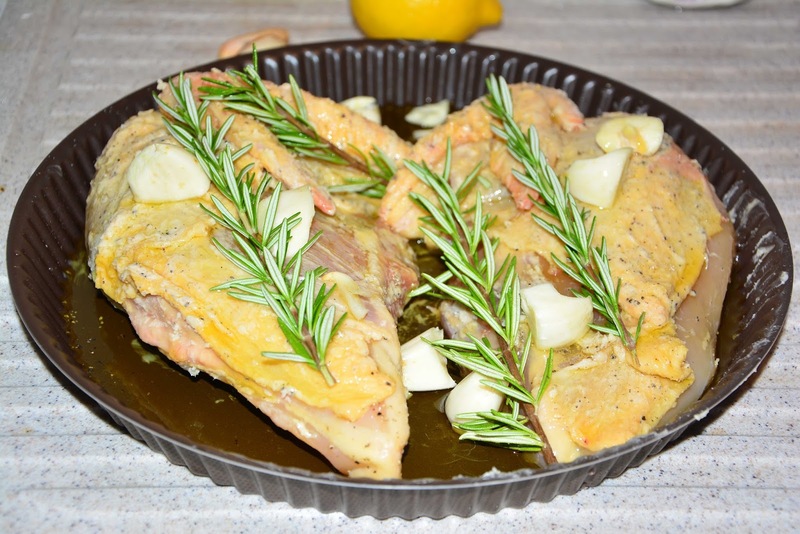 Place two sticks of fresh rosemary below the chicken. Voila! 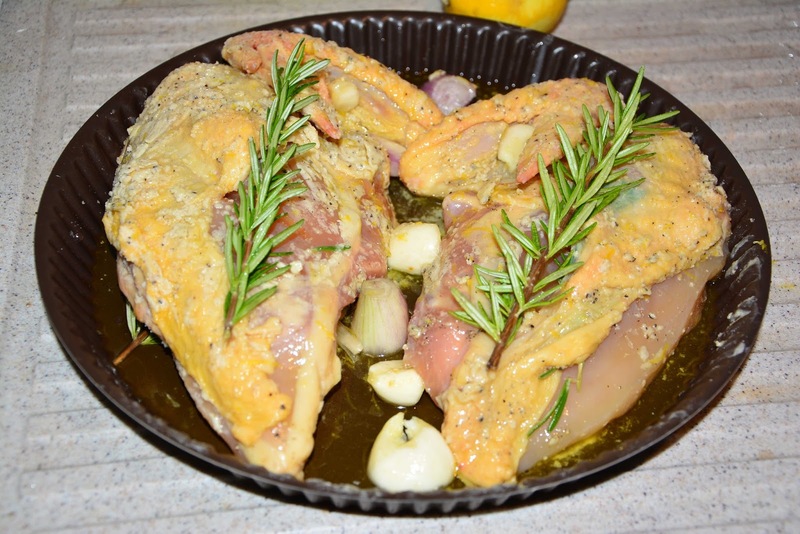 The chicken is ready to be roasted in the preheated oven. Place the roasting pan in the second rack. 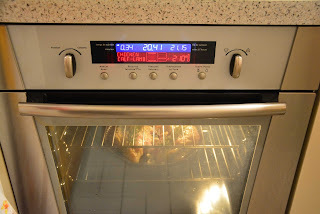 Initially I roasted it for 30 minutes, the first 10 minutes at 210°C (410F) then I reduced the temperature to 190°C (375F). Then take it out from the oven and add around 20 g of cubed butter on the chicken. 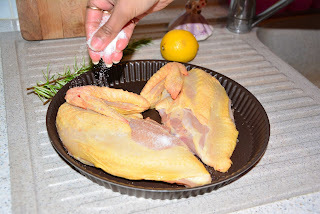 Then turn the sides of the chicken. With the help of a spoon add the liquid that has accumulated on the roasting pan on top of the chicken. Again place it in the oven for 30 minutes at 190C. After 30 minutes, take it out of the oven. 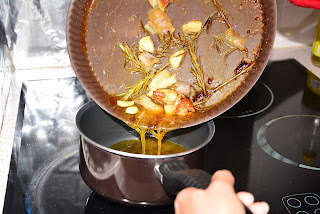 Change the sides and pour the liquid from the roasting tray on the chicken pieces. Take a fork and prick the thickest part of the piece, if the juices run clear, the chicken is done. Cover the pieces with an aluminum foil and rest it for 30 minutes before serving. 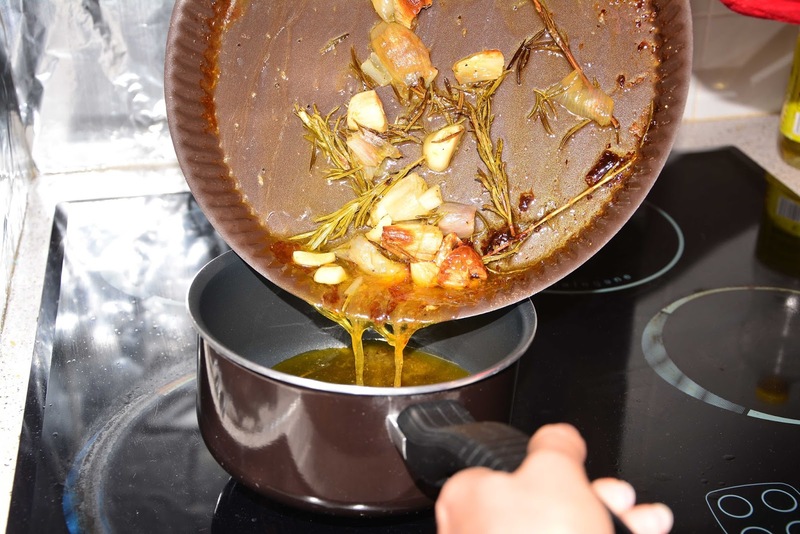 Pour the juice of the roasting pan in a non-stick deep bottomed pan. Season it with salt and freshly ground black pepper and smash the pieces of garlic and shallots roughly with a wooden spatula. 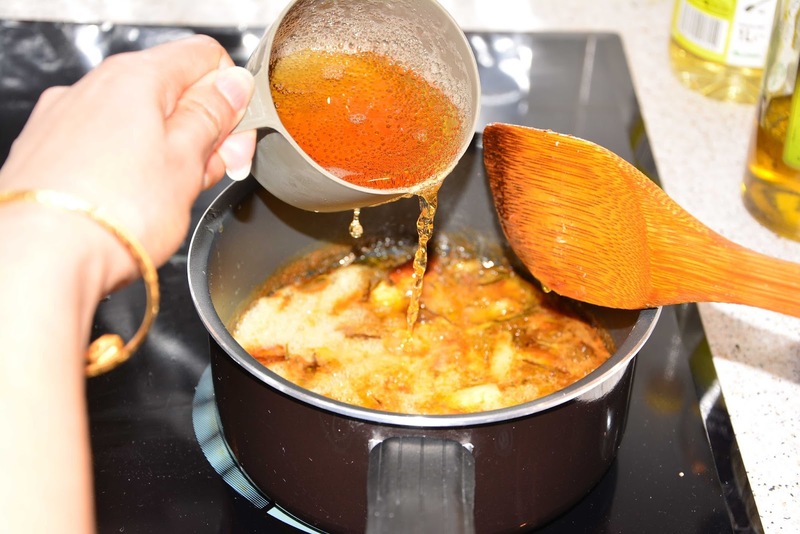 Add the cider slowly to the pan. 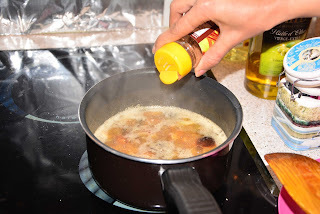 Add the cinnamon powder, give it a stir and seamer it for 15 minutes. Now place the breast pieces on your choice of plate. 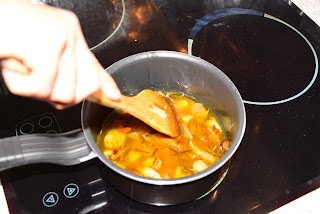 Pour the sauce on top of the chicken breast piece. Voila the chicken roast is ready. Roasted chicken breasts with a cider sauce for the festive season. Season it nicely with adequate amount of salt. Next season it with freshly ground black pepper. Mix two teaspoons of salt with 30g of melted unsalted butter. 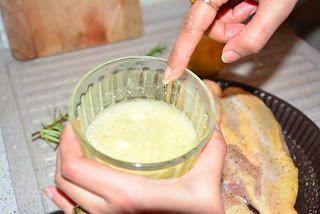 Add freshly ground black pepper to the melted butter mixture. Mix it well. 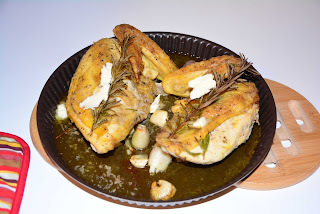 Place the fresh rosemary on the chicken. 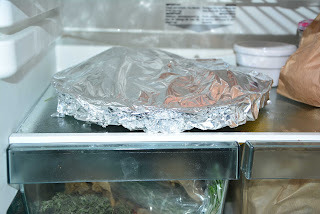 Wrap it with aluminum foil and place it in the lower rack of the refrigerator for an hour. 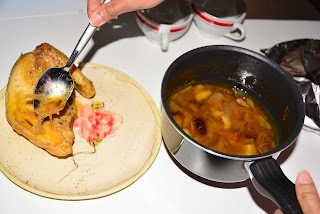 After an hour take out the chicken from the refrigerator and let it come to room temperature. 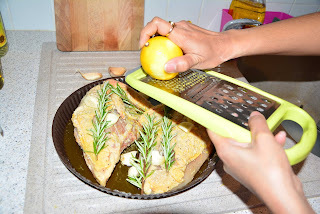 Remove the aluminum foil and add freshly scraped lemon zest to the chicken. Add roughly chopped shallots to the chicken. Place some on top of the chicken, some underneath the skin of the chicken and some below the chicken. Place two sticks of fresh rosemary below the chicken. Place the roasting pan in the second rack. 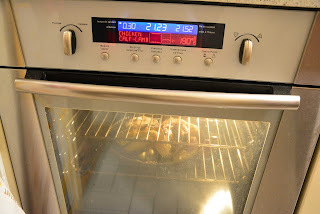 Initially I roasted it for 30 minutes, the first 10 minutes at 210°C (410F) then I reduced the temperature to 190°C (375F). 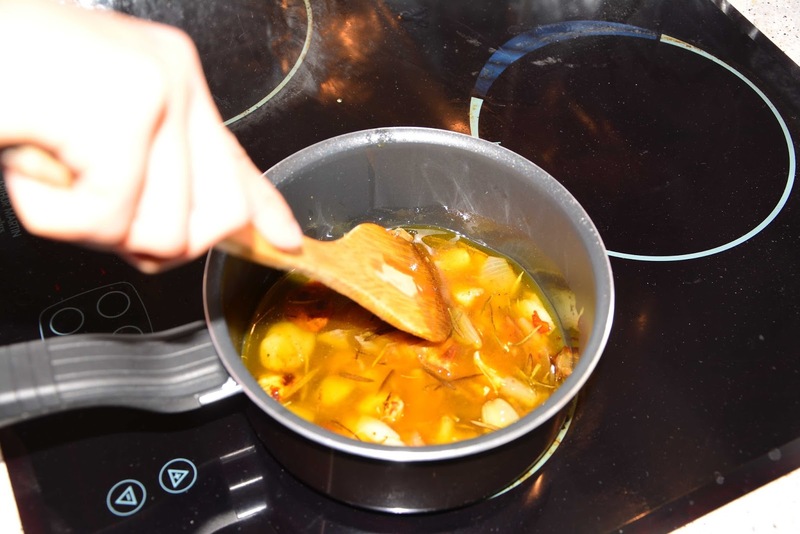 Then take it out from the oven and add around 20 g of cubed butter on the chicken. Then turn the sides of the chicken. 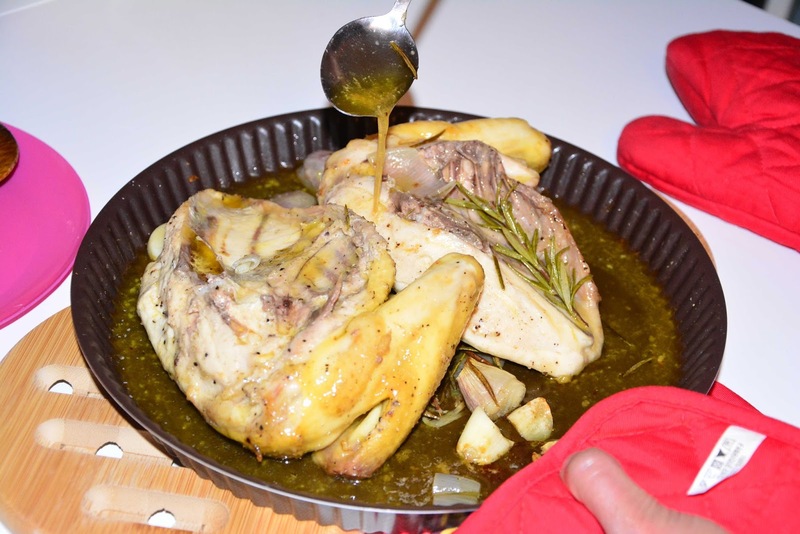 With the help of a spoon add the liquid that has accumulated on the roasting pan on top of the chicken. 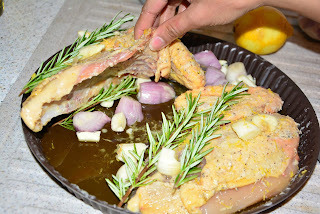 Change the sides and pour the liquid from the roasting tray on the chicken pieces. 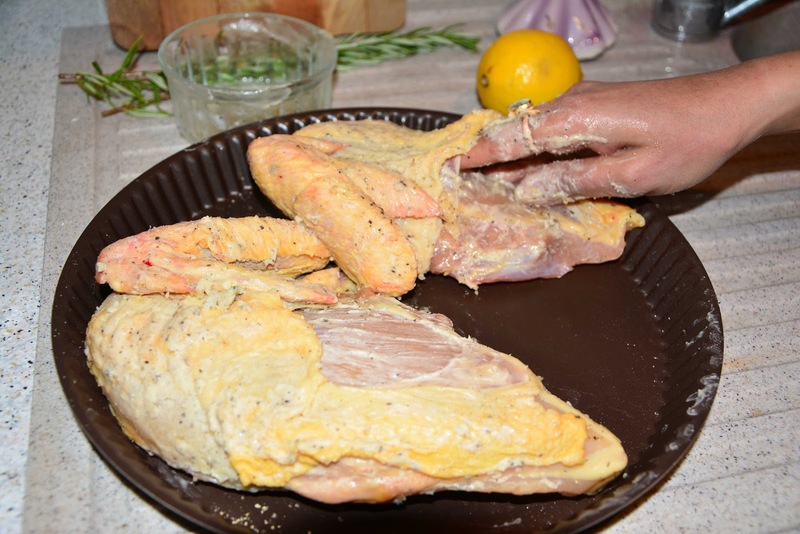 Take a fork and prick the thickest part of the piece, if the juices run clear, the chicken is done. Add the cider slowly to the pan. Add the cinnamon powder, give it a stir and seamer it for 15 minutes.